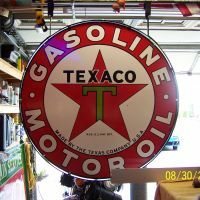 Register Log In Primarily Petroliana Shop Talk Forums Online Auctions, eBay Craigslist Petroliana Texaco flange (or not)? Just me? Anyone see the flange on this sign? Last edited by JOSBORN; Fri Jan 16 2015 02:31 AM. Last edited by Catauladave; Fri Jan 16 2015 11:04 AM. Looks like the flange has been removed. Did they ever use a vise type wall mount for these signs? Last edited by Keystone Gas Man; Fri Jan 16 2015 06:34 AM. I agree.. Flange is missing. $1575.00 Asked seller if flange feature still on sign. No reply.. I knew I couldn't see one. Former flange would be more accurate. Somebody is gonna be *****.